Are Ice Melting Products Environmentally Friendly? - Legends Landscape Supply Inc.
Are Ice Melting Products Environmentally Friendly? Fortunately, deicing technology has come a long way with products that melt ice more effectively without the toxicity of untreated rock salt and that have far less environmental impact. SmartMelt is an engineered blend of organic salts, bio-additives and polyols, which surround granules of a non-organic chloride. This blend significantly lowers working temperature, increases brine production and reduces corrosion. It is the same class of deicing technology demanded by commercial and military airports. EcoMelt technology utilizes a eutectic mixture of dissolved proteins and sugars to coat a non-organic chloride granule. Melt temperature is lowered drastically while increasing the melting capacity of the products. EcoMelt products are made from renewable resources such as sugar beets and used where environmental concerns are top priority. Both of these deicing technologies have an additional benefit. Their increased effectiveness compared to untreated rock salt means you use 30 percent less product, which saves you money. Jet Blue Ice Fighter This deicer meets the highest standards for use on commercial and military runways. It utilizes Gen3 runway deicer, which has super fast and long deicing efficiency. It is non-toxic and does not corrode exposed metal or concrete rebar. It works down to -30C and brine production is 2 to 4 times the amount of untreated rock salt. It is an excellent product for home use also. Besides being environmentally compatible, it will not track inside the house nor stain carpets. Its bright blue color makes it easy to see where it is being applied. Contractor’s Choice Combining economy and effectiveness, Contractor’s Choice uses liquid and solid deicers that meet Aeronautical Material Specification standards with a reduced amount of sodium chloride. Metal corrosion is greatly reduced with a granule coating of X-22 corrosion inhibitor and the use of sodium formate. Uniform granule size with a liquid coating creates a free flowing product that is perfect for push spreaders. It is both pet and landscaping friendly. EcoSalt and GeoSalt Deicers EcoSalt and GeoSalt ice melters utilize beet juice and other naturally-derived concentrates to double the ice melting ability of standard road salt. 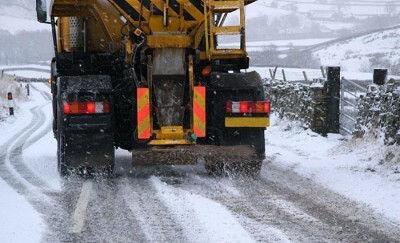 Once applied, Geomelt 55 keeps granules wet, which increases brine production by 30% over road salt. Furthermore, the surface of the granules is tacky, which reduces product bounce and scatter. These deicers go where they are meant to go and stay put. Both products have the ability to melt ice down to -30C. They can be used as an ice preventative also if applied before snow or sleet. Since it is made from renewable, organic sources, it does not harm vegetation, streams or your animals. Even the bag is 100% biodegradable. This is one of the most environmentally friendly products available. Bulk Deicers For those with a seriously large need, bulk deicers are available by the ton. Whatever your deicing needs, Legends Landscape Supply, Inc. has the most effective and environmentally friendly products available for both commercial and residential use. During storms, these deicing products are available 24 hours a day. They include GeoMelt 55 in dry form and GeoMelt S50, which is a liquid mixture of GeoMelt 55 and Tru-Brine Sodium Chloride. Give us a call today and request an estimate on the ice melting products that will keep your walkway and driveway save all winter long.